Perfect coffee cake for Sunday morning. 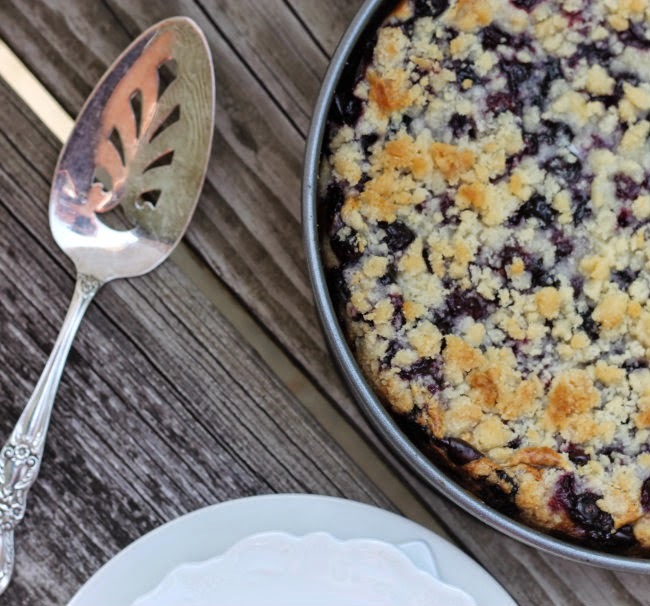 I love this time of year… blueberries are in season. I can remember as a kid my mom would go up to northern Minnesota with her sister to pick wild blueberries. She would come home with tons of blueberries. We would freeze some for later, when the weather would be cold. But I remember my mom would always make these delicious blueberry pies. I am sure this is when my love for blueberries started. 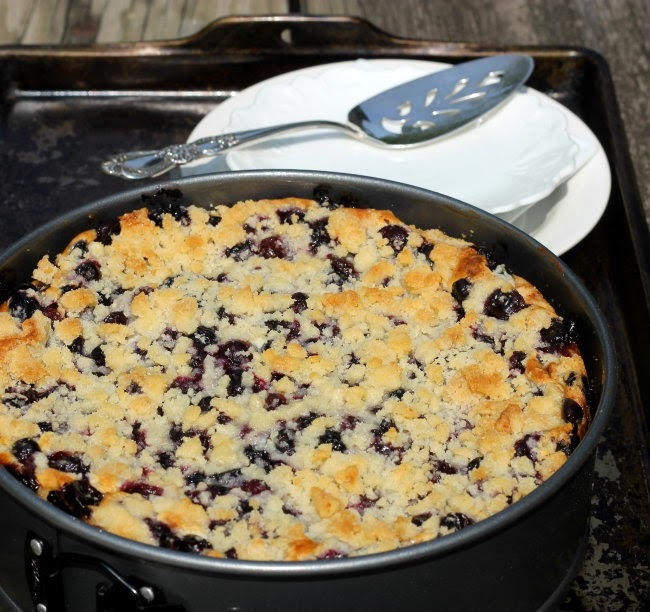 Now I have you thinking that I am going to share a blueberry pie recipe, sorry not today, but I do have a yummy blueberry cheesecake recipe that I think is quite amazing. Sunday mornings always seem to be the right time for a coffee cake, but then again I guess any day can be a coffee cake day. 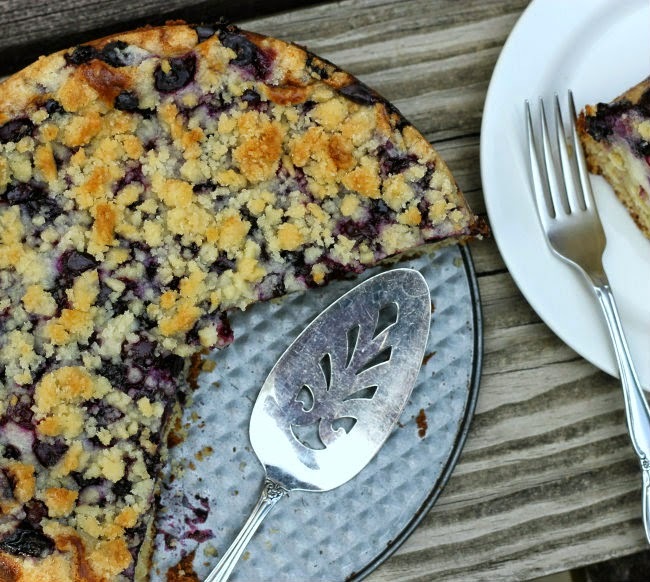 But Sundays seem to call for something special and this blueberry cheesecake cake is exactly that. 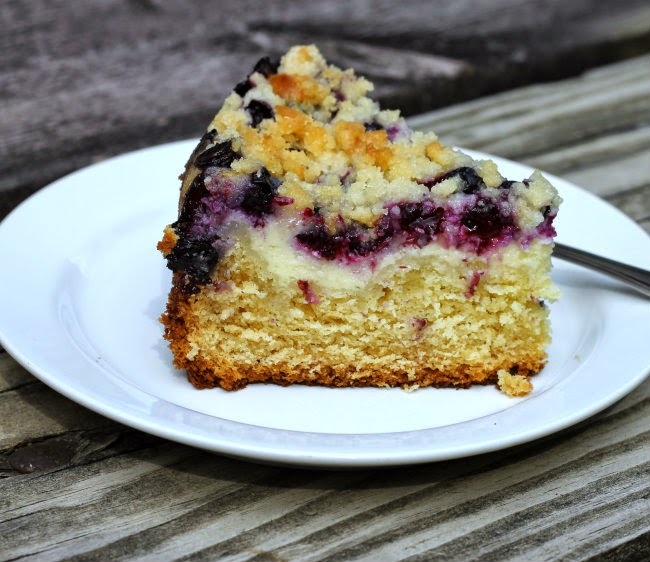 It not only has a yummy streusel topping, but it also has a cream cheese filling, and then all those blueberries. Truly you can’t go wrong with anything this yummy. So if you are looking to spruce up your Sunday morning, this recipe will do exactly that for you. 1. Cream together butter and sugar until light and fluffy. Beat in egg and vanilla. 2. In a separate bowl whisk together flour, baking powder, and salt. Add flour to butter mixture in 3 additions, alternating with milk and sour cream, starting and ending with flour. 3. Mix just until incorporated. Spread evenly into a greased 9 inch spring-form pan. 1. Beat cream cheese until smooth. Gradually beat in sugar until incorporated. Add vanilla and egg. Beat just until blended. 2. Spread on top of coffee cake layer. Sprinkle with blueberries. 1. Mix together sugar, flour, and butter. Using you hand mix the butter until mixture clumps together easily (the butter should be mixed in with no visible lumps). 2. Sprinkle this over the top of the blueberries. 1 Bake at 350 degrees F for 60 to 70 minutes or until a toothpick inserted in the center comes out clean. Allow to cool slightly before serving. I can just picture me serving this to the family with a hot pot of coffee on a Sunday morning. Stomach = growling. This is quite a cheesecake! i am loving the look of this coffee cake, definitely craving a slice! Urm, yes this is the perfect cake for a Sunday morning, or any other morning for that matter….lol. This looks mouth watering!